Recent decades have seen a dramatic shift away from social forms of gambling played around roulette wheels and card tables to solitary gambling at electronic terminals. Slot machines, revamped by ever more compelling digital and video technology, have unseated traditional casino games as the gambling industry's revenue mainstay. 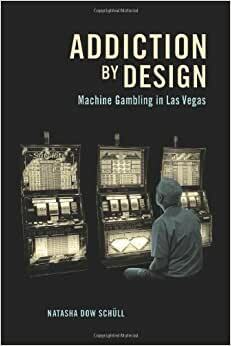 Addiction by Design takes readers into the intriguing world of machine gambling, an increasingly popular and absorbing form of play that blurs the line between human and machine, compulsion and control, risk and reward. Drawing on fifteen years of field research in Las Vegas, anthropologist Natasha Dow Schull shows how the mechanical rhythm of electronic gambling pulls players into a trancelike state they call the "machine zone," in which daily worries, social demands, and even bodily awareness fade away. Once in the zone, gambling addicts play not to win but simply to keep playing, for as long as possible--even at the cost of physical and economic exhaustion. In continuous machine play, gamblers seek to lose themselves while the gambling industry seeks profit. Schull describes the strategic calculations behind game algorithms and machine ergonomics, casino architecture and "ambience management," player tracking and cash access systems--all designed to meet the market's desire for maximum "time on device." Her account moves from casino floors into gamblers' everyday lives, from gambling industry conventions and Gamblers Anonymous meetings to regulatory debates over whether addiction to gambling machines stems from the consumer, the product, or the interplay between the two. Addiction by Design is a compelling inquiry into the intensifying traffic between people and machines of chance, offering clues to some of the broader anxieties and predicaments of contemporary life. At stake in Schull's account of the intensifying traffic between people and machines of chance is a blurring of the line between design and experience, profit and loss, control and compulsion. Natasha Dow Schull is associate professor in the Program in Science, Technology, and Society at the Massachusetts Institute of Technology. Equal parts fascinating and heartbreaking, Ms. Schull's book is one of the few books I've read recently that made me feel like a different person after I finished reading. Though her style is overall very neutral, the simple facts she assembles about the history of the gambling industry constitute the most devastating critique of modern capitalism I've ever read, and forced me to rethink a lot of my attitudes about choice and public policy. But don't mistake this book for any kind of political screed or polemic. It's more like a real-life version of the first third of Ocean's 11, except instead of explaining casino security systems, she's explaining the games themselves. And what games! Through decades of trial and error, game designers have learned more about human psychology than a million studies of bored undergraduates could ever hope to reveal. Mind control may be an overstatement, but after you read the words of the gamblers themselves you'll have no doubt that machine gambling exploits our natural risk preferences and emotions so effectively that many of the people held in its sway have essentially stopped making choices, being unable to satisfy their longings in any way other than continued attachment to a slot or video poker machine. Ms. Schull does not stop there. She takes the reader further, examining the financial structure of the gaming industry, the mindset of key players in the industry, and the uneasy relationship between the industry and regulators, all supported by an impressively thorough set of sources and original research of her own. To her credit, there is no call to action, no indictment of the industry, though her views on the morality of the gaming industry are not exactly hidden. Rather, the reader is left with a vexing set of questions. What to do about the current trend towards legalizing and liberalizing gambling restrictions? What other industries are operating in a similar way (processed food, I'm looking at you)? Does regulation do any good, or does it simply serve to protect incumbent players so long as government gets its cut of the wealth that the industry extracts from players? The answers, sadly, remain elusive. I found this book profoundly interesting. It is not an easy read, but that is more, I believe, due to the complexity of the concepts with which the author is dealing, rather than his prose style, which I find very clear and fluid. The book's emphasis is on the rise of the digital gambling machine, particularly "slots", which account for such a huge portion of modern casino revenues (and profits). The author examines the design and construction of the machines, their interaction with their users, and how this interaction leads to the formation or enhancement of gambling addictions. This is no hackneyed piece of academic research. The author spent many months with "boots on the ground" in Las Vegas casinos and machine manufacturing centers, trying to develop a comprehensive understanding of the forces at play in the modern human-machine interaction. I believe he has succeeded admirably. His explanations of what is really happening in the gambler's mind- and how the machine plays to those cerebral patterns- is profound and much different from conventional thought. If you want to understand what makes casino gamblers tick, and how the gambling industry takes advantage of every nuance of the gambler's psyche, this is a wonderful read. It should not be rushed through, but savored. Highly recommended, and ground-breaking research, compellingly presented. I'm only about a third of the way through, but the book is an eye-opener. The author has done some incredible research relating to the deliberate programming and manipulation of both the gambling machines and the environments in which they are placed. I'm looking forward to finishing the book. It's interesting to draw comparisons between the gambling machines (and the psychology behind their development) and the smart phones that people just can't seem to set down. I could not put this down and read it in a few long sittings, not unlike the long sittings of the people sitting on stools at casinos that are the source material of much of this book. I found it interesting, enlightening and depressing in places. Whether you play slot machines or not, you'll never look at them the same way after reading this book. My only gripe (and this is not really a gripe) is that (in at least the Kindle version) almost half of the book is taken up by notes. I was reading it and enjoying every page and thinking I still had about half a book left and then I got to 53% on the Kindle and it said I was nearing the end of the book. It was so well written that I would have liked to have read more. 5.0 颗星，最多 5 颗星All you need to know about slots and addiction. I have been gambling for over 30 years. I have almost never played the slot machines. After reading this book I never will in the future. Through years of careful research the author details how slot machines have been designed to extract money from slot players through extensive yet covert psychological manipulation. The techniques are based on the theories of B.F. Skinner and go to a truly unbelievable level. I never imagined the sophistication of the science being applied here. Also examined are the players themselves who through interviews with the author describe how they are lulled into what they call the "machine zone". This is a place where the player enters into a state they describe as similar to suspended animation. The player shuts out everything around him or her and focuses on continuing to play solely to stay in that zone hour after hour. There's more in this book than I have time to write about here. This book is based on thorough, level headed and objective research. It will open your eyes to what slot machines and the people who are involved with every aspect of them are all about.